Rembrandt van Rijn is recognized as the greatest Dutch painter of the seventeenth century, famed for his versatility in all genres: portraits, landscapes, and history painting, including secular, religious, and mythological subjects. In his maturity he developed a loose, highly expressive brushwork combined with a psychological intensity. Rembrandt was the most prolific portraitist of his time and produced an unrivaled series of self-portraits. Bust of a Young Jew was painted as a character study (tronie), rather than as a portrait commissioned by an individual. The dramatic lighting, which focuses attention on the subtly characterized face, achieves nonetheless many of the effects of a true portrait. The work was doubtless painted from a live model. 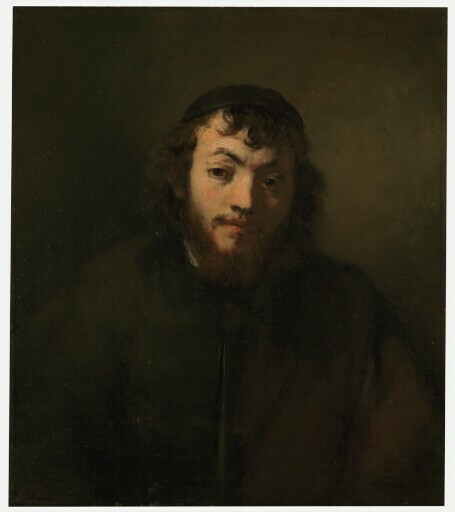 The sitter’s modest apparel, full beard and curly hair-style, and black skullcap—which was not, however, worn only by Jews at the time—identify him as a member of the Jewish community in Amsterdam. Rembrandt’s penetration of outward likeness to suggest the temperament of the sitter is conveyed with his typically deft and economic brushwork. Animated by the strong light that casts one side of his face into deep shadow, the compelling figure is painted in the “rough manner” of the artist’s late style, with a limited palette of earth colors. Rembrandt defines the forms with assured, vigorous brushstrokes. possibly his heirs, the Despuig counts of Montenegro, Raxa, Palma de Mallorca, Spain. presumably by descent to Nicolas Cotoner y Allendesalazar, 2nd Marqués de la Cenia [1847-97], Palma de Mallorca, Spain. (Duveen Brothers, Paris, London, and New York, 1907). Possibly (M. Knoedler & Co., New York, London, and Paris, 1912). purchased by Kimbell Art Foundation, Fort Worth, 1977.